Warmer weather is your invitation to get on a bike and explore, Buffalo. 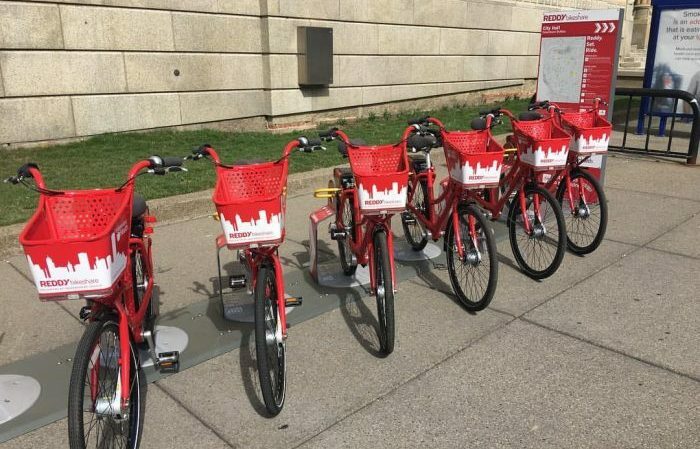 The Reddy Bikeshare program makes getting around easy and affordable since they’ve got bike stations scattered throughout the city and beyond. To make it even easier on you and your gang, we’ve put together a list of where to find bike racks within the city of Buffalo, plus recommendations for super cool places to stop along the way! For more info on how the bike share program works and how to make the most out of it, check out reddybikeshare.socialbicycles.com. They have live info about availability and everything! You can even reserve a bike in advance from your phone. Don’t forget! There are also bike racks near Buffalo State College, Canisius College, and UB South campuses. For a map of all the bike rack locations in Buffalo, visit reddybikeshare.socialbicycles.com. 339 Ganson St., 3-7 Marine Dr. If you are headed to an event at Riverworks, there’s a bike rack right outside the venue. Inside you’ll find four bars, a restaurant, and a concession food area. There’s also a beautiful beer garden overlooking the Buffalo River. When your favorite team is playing, there’s no better screen to be in front of in Buffalo. Besides the 38-foot feature screen, there are 70 additional TVs in this restaurant. 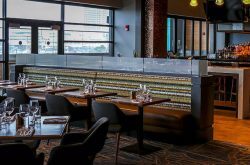 After a concert at Canalside, continue to enjoy the beautiful waterfront on the patio at Liberty Hound. Biking is a must on a beautiful, sunny Tuesday. Skip parking on Food Truck Tuesdays, and spend more time eating. Since different food trucks come each week, there’s always something new to try. If you are in the Larkinville, check out these tasting rooms for local brews and spirits. Hungry? Order a brick oven pizza to enjoy in the gorgeous beer garden. 275 Washington St., 181 Ellicott St., 336-348 Main St., 65 Niagara Square, 1 Lafayette Square, 472 Main St., 250 Delaware Ave., 664-668 Main St. This classic Buffalo pub is a favorite for local brews. There’s plenty of seating inside and out to enjoy a meal and drinks. If you are biking near Buffalo City Hall and in the mood for pizza or pasta stop here. This casual Italian is open for lunch and dinner and they have happy hour deals every weekday. When you need an energy boost, visit Hotel @ The Lafayette for made to order coffee and espresso varieties. In the Chippewa District, there are lots of places to grab a drink or a meal. This place is on our radar, since they have a brand-new menu and plenty of local craft brews to try. 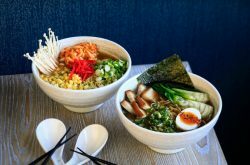 Find five restaurants and a bar all in one location here, with choices like salads, rice bowls, burritos, smoothies, sushi, pasta, and deli sandwiches. 722-736 Main St., 567-603 North Oak St., 26 Allen St., 181 Allen St., 109-137 Allen St., 262-270 Allen St., 215-217 North St. Eating out and eating healthy actually go together at this artsy cafe. They have lots of vegan, vegetarian, and gluten-free options on their menu. If you are meeting a friend for a drink, this historic pub is a casual choice that’s easy to bike to. Pro tip: Prepare to be quizzed by the owner; he’s a former social studies teacher. Step back in time at Buffalo’s oldest tavern, where you’ll now find karaoke nights every Tuesday. Get a second wind when you visit this coffee bistro at the corner of Allen and North Pearl. They are always mixing up their menu with new featured drinks, and their coffee swirls are definitely Snapchat-worthy. This pub with a patio is open for lunch Tuesday through Friday, serving classic pub burgers, sandwiches, and more. Pro tip: They also open for happy hour during Allentown’s First Fridays. Grab a cup of coffee or tea, or for something different try pour-over coffee infused with your choice of tea. They call it a Buffalo Tea Party. Biking burns carbs, so you can easily justify a poutine pit stop. Besides traditional poutine, they have buffalo chicken, chicken bacon ranch, montreal smoked meat, philly cheese steak, and sloppy joe poutine. This cafe may be quaint, but it’s very inviting. Visit Allentown’s secret coffee shop to try one of their fresh chai drinks. If you are more of a wings guy or gal, visit the Lennox for $0.50 Wing Night on Mondays. They have the classic mild, medium, hot, suicide, and barbecue wings, plus the chef’s daily special. 414-436 Elmwood Ave., 478 Elmwood Ave., 538-554 Elmwood Ave., 630 Elmwood Ave., 695 Elmwood Ave., 951 Elmwood Ave.,1097 Elmwood Ave., 1136-1208 Elmwood Ave., 230 Lafayette Ave.
Flavored roasts are rotated weekly with beans from Goodrich Coffee and Finger Lakes Roastery. They also have breakfast burritos and sandwiches, vegan baked goods, and gluten-free treats. Grab a craft cocktail, all of which are as beautiful as they are delicious, at this beautiful bar. They recently released their new spring menu, so there’s new featured drinks and plates to try. The newly reopened will welcome a porch this summer, making it a new hotspot for outdoor dining in the Elmwood Village. Fresh ingredients are plentiful here. Order a speciality sandwich, wrap, or salad and rest your legs at a table outside while you eat. Venture down Lafayette Avenue to Grant Street to get your fill of caffeine. They use fair trade roasted beans for all of their drip coffee and espresso drinks, and they have house made iced black tea, hibiscus lemonade, and Italian soda. If you are headed toward Bidwell Park this cafe is right there brewing all kinds of coffees and teas and serving beer, wine, cocktails, and even coffee cocktails. Stop in to quench your thirst however you choose. When you NEED souvlaki this is the place for fresh and authentic Greek food. Pro tip: their honey dipped fried chicken is ridiculously delicious too. Bike to brunch, why not? This is the spot to be on Sundays. Their brunch menu is packed with choices, and their carafes of mimosas are ideal for sharing. If you prefer a Bloody Mary with your meal, they have lots of those too. Every day is lovely day for coffee. Re-energize with a cup of coffee from the pour over menu. When you need something quick, grab a bagel, sandwich, or pretzel. All these items are produced using a long ferment sourdough process, giving them a unique taste you won’t find anywhere else. 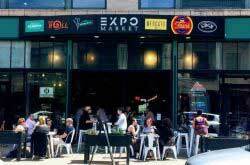 1361 Hertel Ave., 1424 Hertel Ave., 1472-1478 Hertel Ave., 1637 Hertel Avenue, 1756-1764 Hertel Ave., 1856 Hertel Ave.
Stop by everyone’s favorite neighborhood cafe for their classic brewed coffee, or try a refreshing blender drink like the Cinco Shake, SPoTsicle, or Protein Power Shake. Need a drink? Make a pit stop for at Buffalo’s original soccer bar for summertime libations. Refuel as you make your way down Hertel. The Taco Factory combines street food and a fully stocked bar to offer tasty tacos and craft cocktails made with hand pressed juices. Love beer? Visit Burning Buffalo and find out what’s on tap. New on the block, they offer a spacious patio perfect for sharing a nacho platter and margaritas with friends. Further down Hertel, you’ll find locally roasted coffee and live music. Grab a cold brew, specialty roast, iced coffee, espresso drink, or iced tea while you enjoy the entertainment. There are also bike racks near Buffalo State College, Canisius College, and UB South campuses. For a map of all the bike rack locations in Buffalo, visit reddybikeshare.socialbicycles.com.